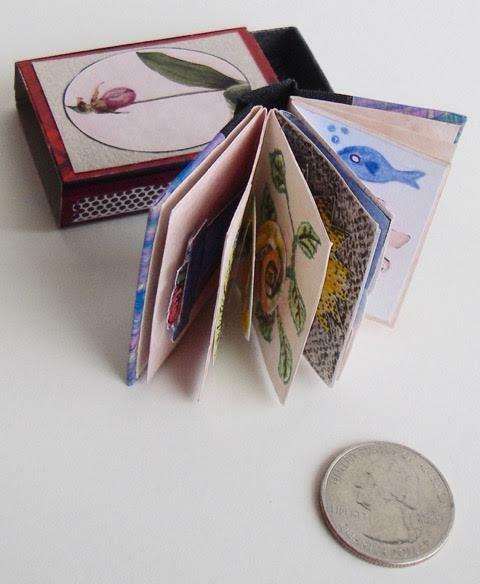 A popular class taught by Jackie Wygant at the Newport Paper & Book Art Festival last month was how to make a miniature pop-up book in a matchbox. This month Edge Gerring will show us how to make a hardcover book with three pop-ups. There's too much to do to repeat the whole class, but a miniature pop-up book is very doable. Edge will show and tell us about decorating a matchbox so you can do it at home, but there won't be enough time to do the matchbox in this class. This book is small, but not TOO small, so don't be afraid to come and play. Note: the exchange book theme for June is Miniature Pop-Up Book so the timing of this workshop is ideal.